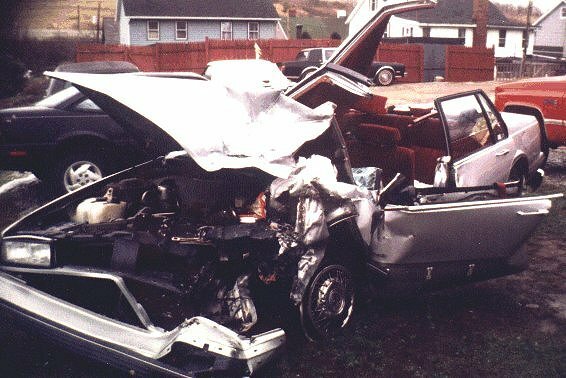 On the evening of November 30th in 1996, my family and myself were hit head-on by a drunk driver named Lori Descani. My father was driving, and I was in the front seat with him. In the back was my wife, my mother, and my eight year-old daughter. All five of us were seriously injured, which you can probably assume by taking a look at this photo of my father's car, for this is what it looked like following the crash. The drunk driver (who was asleep at the wheel) never knew that she crossed the center line of the road. At the scene, she never even knew that she hit us. I am very happy to tell you that everyone survived the crash, but that does not mean that things were not uncertain for quite a long time, or that the injuries are now just a memory. I will briefly tell you that my wife and mother were badly bruised from head to toe, but they were released from the hospital late that night. My father underwent emergency surgery for the numerous broken bones that he suffered. My daughter had her intestines perforated in two places, her pancreas was shut down, and her back was broken. The doctors warned us that it was very likely that she would not live through the night. When she came out of surgery, things were still uncertain. But after a long strong stretch in the ICU of Children's Hospital of Pittsburgh, she was finally put into a private room. After a month, she was released from the hospital on a liquid diet, and in a back brace that she would wear for the next nine months. I have never seen a braver person than my eight year-old daughter. She is now 18, and she is doing great. Just by looking at her, you would never know the hell that she was put through by a drunk driver. As for me, I suffered severe head injuries that plague me to this day. The night of the crash, I checked myself out of the hospital to be with my daughter. My face was badly battered, and the top of my head had been bruised severely. I do not remember all that happened, so I will not attempt to cover all of the details. However, I will tell you that my head injuries brought on constant blackouts, constant headaches, severe dizzy spells, blurred vision, slurred speech, loss of physical dexterity, seizure-like episodes, loss of memory, and loss of comprehension skills. As I write this, we are approaching ten years since the crash, and I am about 70% recovered, and that is about as good as it will ever get. Now please do not think that I am complaining. On the contrary, I celebrate that I am able to accomplish the things that I do. Even though I still suffer from the all of the problems listed above, I am very fortunate to have had some wonderful folks around me that have helped me to learn how to work with the cards that I have been dealt. One of the best examples is a wonderful lady by the name of Dr. Carol Schramke. After seeing numerous neurologists and neurosurgeons, I was sent to Dr. Schramke to check on my comprehension and retention skills. It was a very low point of my life, but somehow, she was able to get me to understand how to work with what I had, and not to dwell on what was now gone. It was during one of my many sessions with her that she gave me an assignment. Knowing that I had a background in magic, she told me that one of my exercises was to write a book. After telling her that she was crazy, she persisted and sent me away with my assignment. For several months, I sat in front of a blank computer screen, and an empty tablet. Nothing came but frustration and tears. Even though I had my own notebooks to get me started, they looked completely foreign to me for I could not understand any of the routines that I had written prior to my injuries. And then one day, a few words ended up on the computer screen. And then a few more. I will tell that I really do not remember doing it, but somehow, after many months of writing, I had a book. It was in a very rough form, but it was a book. After proudly showing it to Dr. Schramke, I began to show it several friends and family members. They all suggested I publish it, but I figured that no one would be interested in my ramblings, but as usual, I was wrong. It was that assignment from my doctor that became The Book Of HauntedMagick, which was released on December 7th of 2000. It has now sold in over thirty countries. I tell you all of this to let you know that I have not given up. And no matter what obstacles you face in life, the key is to keep trying. Today, I still suffer from the same problems that I did after the crash. But I have learned (with the help of others) how to manage those problems. What I could once accomplish in a single day, now takes me an average of five to six days to complete. I am unable to keep a regular schedule, because if I do not rest when my body tells me to, I end up right back where I was in December of 1996. However, if I take my time, and let my body tell me when I can and cannot continue, I can actually do things that I thought would never be possible. That is how I am able to travel the country and lecture on a very limited basis. It is what allows me to write, and although it takes much longer than it would have years ago, I am still able to be productive. There are times that I wish that I could function like I did before the crash, but I try not to dwell on those thoughts because they will only bring me down. Instead, I concentrate on the positive, and I let life take its course. For those that know me, they know that I am a diehard skeptic. My faith is in science, not astrology, psychics, faith healers, or any of that other new age crap. But I will tell you that I have learned that there is such a thing as real magic. It is alive in the form of passion, and true magic can be found in true passion. True passion can take you to a world that seems unreachable.